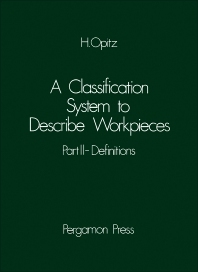 A Classification System to Describe Workpieces provides information pertinent to the fundamental aspects and principles of coding. This book discusses the various applications of the classification system of coding. Organized into three chapters, this book begins with an overview of the requirements of a system of classification pertaining adequately and equally to design, production, and work planning. This text then examines the purpose of the classification system in production to determine the most suitable means of machining a component. Other chapters consider the optimal utilization of machines, which comes within the scope of production control. This book discusses as well the rotational components that are separated into segments after rotational machining are rotational components with deviations. The final chapter deals with rotational components with cast, forged, or welded stiffening or with recesses not affecting the function of the components. This book is a valuable resource for engineers involved in machine tool industries.